In an energetic one-man show last Tuesday that must have gone on for around an hour, Tebas spoke on the theme of whether the “project of a European Super league” was “feasible in the face of the reality of consolidated national leagues such as La Liga, the Premier League and the Bundesliga”. To back up his argument, he pointed to the day two weeks ago when Liverpool played Manchester United in the Premier League at the same time as two of La Liga’s lesser lights Eibar and Osasuna clashed in the Spanish Basque country. In Spain, Tebas stated, more people watched the La Liga game than the goalless draw served up by two of club football’s global giants. When two La Liga bigwigs – Sevilla and Atlético Madrid – played each other on the same day as United’s recent pummelling at Stamford Bridge, he said, the audience in Spain for the La Liga game was 11 times bigger. Of course, just because some of the expectations being set for the Super League appear implausible, it does not necessarily follow that clubs taking part in it would not earn more than they do from the Champions League. Plus, for the fortunate few, Super League participation would be 100% guaranteed. So Tebas’s peroration, however rousing, did not leave me wholly convinced. What I was thankful for were a series of slides he had prepared offering a succinct summary of the current state of play in media rights values, based on the last contract signed by the various organisations mentioned. The Big Picture? The global media rights value of all sports at present is put at €37.7 billion. Of this, football accounts for €14.6 billion, not far off 40%, and European club football €11 billion. England’s Premier League is far and away the most valuable of these European club football properties at €3.58 billion a season, followed by the two main UEFA competitions, the Champions League and the Europa League, at a combined €2 billion, La Liga (€1.66 billion), the Bundesliga (€1.33 billion), Serie A (€1.25 billion) and Ligue 1 (€759 million). Looking solely at domestic rights, the Premier League again comfortably leads the way at €1.99 billion, followed by the Bundesliga (€1.15 billion), Serie A (€1.07 billion), La Liga (€1.03 billion) and Ligue 1 (€726.5 million). The English leviathan dominates the international picture, generating more than 60% of international rights income produced by Europe’s Big Five. This amounts to €1.59 billion, compared with €632 million for La Liga, which has been on an ambitious marketing drive in recent times, €185 million for Serie A, €180 million for the Bundesliga and just €32.5 million for Ligue 1. 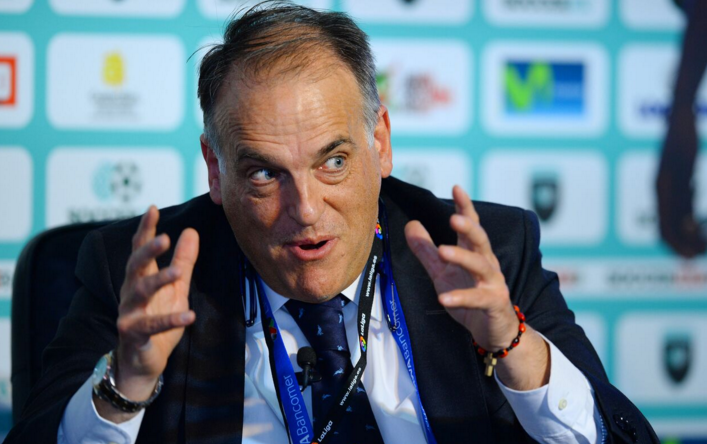 Bolstered no doubt by the region’s large Hispanic population, Tebas’s slides indicated that La Liga is not too far behind the Premier League in the America zone, at €208 million versus €249.5 million. The slides further showed that Champions League/Europa League rights income is concentrated heavily in the Europe-Middle East-Africa zone. This accounted for €1.67 billion of the overall €2 billion figure, with America adding €159.3 million and Asia-Pacific €131.4 million. Information was attributed to Sportcal and Sport Business. As I say, entertaining as it was, I was not totally convinced by Tebas’s argument. Those who do buy what the Spaniard is saying, however, might reasonably ask why UEFA doesn’t take a firmer stand against the big clubs’ demands and insist on a less inequitable distribution of income.